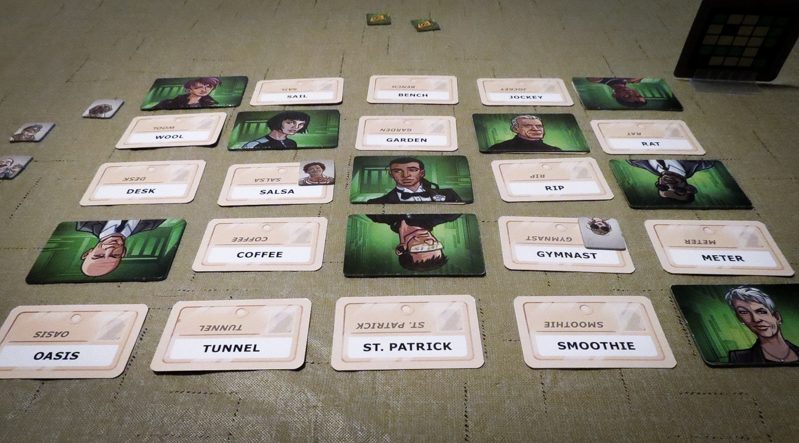 This Codenames Duet review is based on about a zillion games played. Codenames Duet is a cooperative deduction game in which players are trying to locate 15 secret agents by sending each other code words. If you’ve played Codenames or Codenames: Pictures, you shouldn’t have too much of a problem understanding how this version works. Codenames is published by Czech Games Edition and designed by Vlaada Chvátil and Scot Eaton. To begin a game of Codenames Duet, you’ll put 25 random word cards in a 5×5 grid. Then you’ll set up the key card so both players can see where their agents are located. What makes Codenames Duet quite different than the other Codenames games is the way the key cards are set up. The two sides of each key card have different arrangements of agents, bystanders, and assassins. Three of the nine agents on your side of the card are the same on the other side, while all of the other agents are in different locations. One of your three assassins will be in the same location on the other side of the card, one will be a bystander, and one will be an agent. Together you’ll need to find the 15 agents (six unique words apiece and three shared). On your turn you will give a one-word clue about cards on the table. You will say the word and the number of cards that word pertains to. For example, you could say “Knight: 2” for the words castle and sword. After a clue is given, the guesser chooses words by touching them. If the guesser touches a card that represents an agent, the clue giver places an agent card on the word. If the word chosen was an innocent bystander, an innocent bystander / timer token is placed on the card and the turn ends. If one of the assassins is chosen, the players immediately lose. If the guesser wants to stop his or her turn after making one or more correct guesses, they take one of the timer tokens. Each turn uses up one of these tokens, whether by accidentally choosing an innocent bystander or by voluntarily ending a turn. You get one last “Hail Mary’ turn once all of the timer tokens have been used up (there are nine timer tokens in the standard game). You can make as many guesses as you want until you either find all of the agents or you run into a bystander or an assassin. If your team is able to find all 15 agents before time runs out, you win! The game also comes with a set of Mission Maps, which allow you to play a campaign-style series of games with varying difficulties. The missions change the number of turns you can take and how many mistakes you can make. You can also play Codenames Duet with more than two players. It’s pretty much the same rules, but you can quietly discuss clues and guesses with the other players on your side of the key card. Codenames Duet is insanely easy to learn and teach. Even if you’ve never played the original Codenames, you can learn how to play this one in a few minutes. Some people might struggle working with the key cards at first, but they’ll know what they’re supposed to do on their turns. The double-sided key cards are what make Duet better than the other Codenames games, in our collective opinion. These small changes to the original game add in a new layer of deduction. I was so happy in a couple of games when one of my assassins (agent on the other side of the card) was covered up because it gave me more clue options. This game is super challenging with most word setups, which is great! It forces you to learn how to work together to cover as many words as you possibly can. There’s so much replay value here. There are 400 different word cards and 100 key cards, so it’s pretty much impossible to play with the same setup twice. There’s a theme here, but most people aren’t going to think of themselves as covert operatives while playing. It’s really not a big deal, but just know going in that it has a thin theme at best. Some people will not like that they are forced to give clues in this version of Codenames. It’s really not easy to do in some cases, and that could frustrate some folks. Codenames Duet is an excellent two-player deduction game. I’ve had a chance to play it with about 10 other people and all of them wanted to play again and again… and again and again. We’ve played with more than two also but the consensus is that the original Codenames is better when playing with more than two. If you’re a fan of Codenames and want a great two player version, definitely get Duet. If you love word games, deduction games, and/or two-player cooperative games, Codenames Duet is a must-buy. 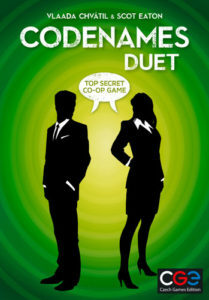 Codenames Duet is already on our Top 5 Co-ops for Two Players list. That’s how much we’ve enjoyed this game. 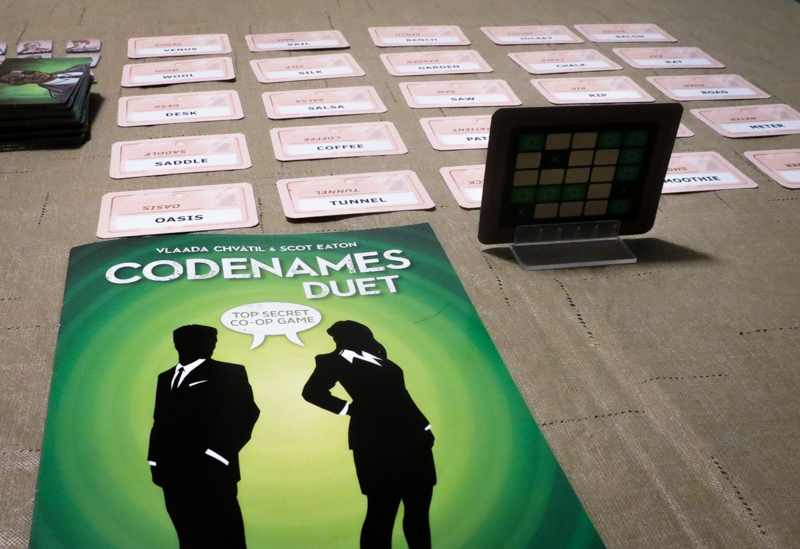 Thanks for taking the time to read our Codenames Duet review!